You will need to make a trip to Walmart and Radio Shack. You will need a soldering iron, a little bit of wire, glue/epoxy, a charging pad from one of your many Bit Char-g or Microsizer controllers, a drill, and about an hour of time. Hue35 and I conducted a federally funded study over a 3 month period to determine the best adapter for charging your Bits. This one is the best. 1000mA is the rating you are looking for, though 800 will work (1500 would probably work too, but would take it’s toll on your car batteries). It aslo does multiple voltages, so charging dual and triple cell cars only requires the flick of the switch. Be wary of Radio Shack adapters, they have build-in short circuit protection, which renders them useless for this purpose. Actually, one adapter we found that seemed to charge the cars better was a Sony 3 volt adapter that was rated at 700mA, but put out substantially more than that. Hue35 will have to add that detail, I forgot the meter rating. On the end of the cord you can see the N Adaptaplug you’ll need to get at Radio Shack. It’s kind of weird that Walmart and Radio Shack products work together. As you can see, I drilled another hole, and started a second (third time’s a charm!) The original hole was when I had this wired up with a male Adaptaplug connector that I plugged straight in to the power adaptor. the second hole that I started is where I wanted to put the jack. 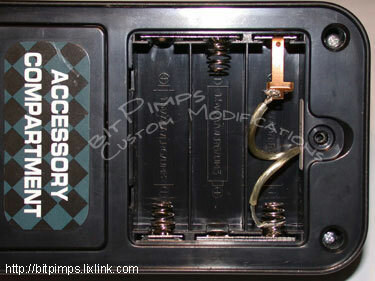 The reason it has to be where it is has to do with the location of the PCB and battery compartment inside the charging base, and the room you will need for the back end of the jack. 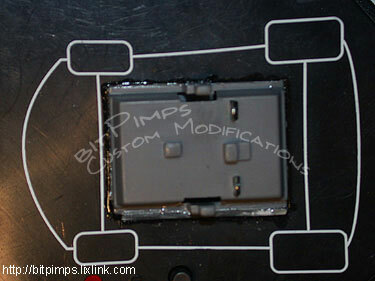 As you can see, I shimmed the sides with some other plastic bits and doused it with model glue. The height is fairly critical, as in don’t make it too low so your car’s tires keep it from seating on the pad. 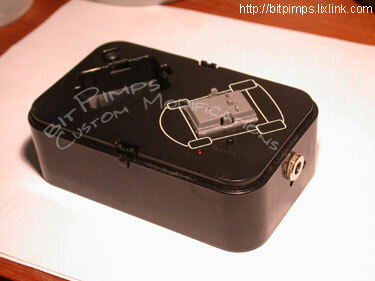 I also reinforced mine on the back side, since this little piece of plastic is going to see lots of action. You can tell by how rounded off all the plastic is how many charges this base has given. 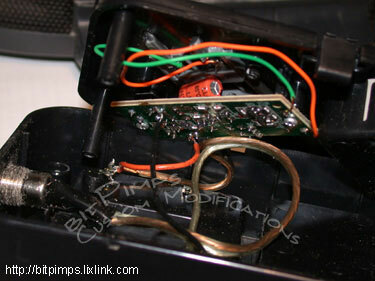 Once the glue has dried, solder the wires on to the PCB where the MotorWorks pad was attached originally. You have to keep the red/black wires going to the same places on the PCB, but it doesn’t matter from the jack to the battery contacts. 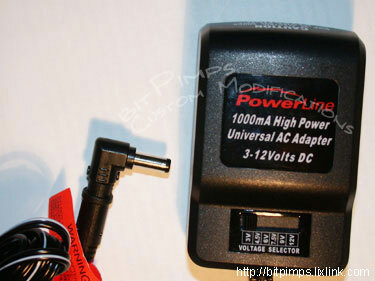 You can control polarity with the Adaptaplug by sticking it on the cable 180 degrees either way. I left the wires from the battery compartment in place so I can still use this charging base with batteries. All you need to do is solder the tabs on the jack to the contacts where the battery leads go from the batteries to the PCB. I even rigged up a little jumper so I can do both single and dual cell cars with batteries. I’ve done tons of mods over the last 8 months, and this is by no means the flashiest, but is by far the most useful. Charging your car with the same batteries you use to transmit signal creates two problems: inconsistent charges and reduced transmitting power (= less range). Since I started using this, I haven’t changed the batteries in my controller, and I use it quite a bit. Hue35 and I each have one of these, and it makes our charges so consistent that if we have equally conditioned batteries, we will run out of charge within 20-30 seconds of eachother. We usually double or triple charge with no ill effects to our car’s batteries. we have a couple cars with 200mA batteries, and those take a quadruple charge, no problem. The beauty of it is just hitting that button when the light goes out (and trying desperately to count to 3 without forgetting). I may add more later, but that about covers it. Questions? This entry was posted on Wednesday, September 24th, 2003 at 2:48 pm	and is filed under Electronics, Micro. You can follow any responses to this entry through the RSS 2.0 feed. You can leave a response, or trackback from your own site.